When a patient no longer has any natural teeth, complete dentures are the traditional method to restore function and appearance. Many patients experience difficulty wearing conventional dentures because of poor stability and decreased chewing function. The use of dental implants to improve the stability and retention of dentures has become quite popular. When there are multiple missing teeth, the remaining anchor teeth may be utilized to secure an acrylic or metal framework upon which the replacement teeth are placed. This prosthesis should be removed on a daily basis for cleaning purposes. 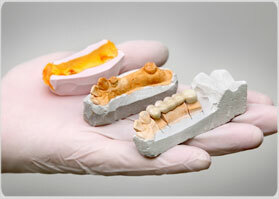 Implants can also help with the stability of this type of denture.